A flexible range of ip pbx systems are developed by us to fulfill the specific demands of our valued clients. Our team of quality analyzers performs several tests on various parameters defined by international quality standards. Our clients can purchase them from the markets at the affordable prices that suit the budget of our clients. Ip PBX are the most essential need for any firm and organization. This products are used in various application as for intercom system in office or housing society. Installation of IP-PBX is very much easy to install and can be integrate with your existing lan network. The device do have combination of both hardware and software. Accessible to maintain all the reports of calls with recording system and live monitoring. This Technology doesn't evolve a lan cabling option. Rather it works on SIP technology and requires only Internet and computer networking. Fibre cable are used for multiple communications. No Noise in verbal communications and no disturbance.Digital Communication mode. This Product are widely used in Housing Society as for intercom purpose. All the communications held in society are recorded and as per the security reasons or else.The best part of this technology as their is no noise or distance. Aria Parth is strong Unified Communication System which can be used in various applications as intercom system for office and housing society. You do not need of separate cabling like traditional PBX. The system helps you to establish communication on existing LAN network. ISDN PRI can be connected with inbuilt card, analog trunk and GSM connectivity through gateway. Can be integrated with SMS/Email, Existing CRM/ERP database. PARTH Office 100 is Unified Communication System can be used as IP PBX appliance. The system is useful for office & bigger complex, Housing society communication. Communication can be done on existing LAN network. The system does not require separate cabling like traditional PBX. Aria Parth Office has all option to connect trunk as ISDN (E1), Analog Trunk, GSM, SIP trunk etc. An IP PBX system enables phone calls ove IP network. Aria UCS IP PBX system has all option all option to connect trunk as ISDN (E1), Analog Trunk, GSM, SIP trunk etc. Aria Parth IP PBX is unified communication system which can be further integrated with SMS/Email, Existing CRM./ERP database. Parth Office 100 is Unified Communication System, mainly used for office communication. The system is a combination of Voice Logger, Conference Bridge, IVRS, Dialer etc. The connectivity related to interconnection and mobile networks needs to work in any mode whether by IP phones, Normal phones or Mobile Phones. Parth Mini-IP PBX System is built on SIP technology and helps to reduce your cabling cost. The system is most suitable for Housing societies, SME’s, shopping mall, Office communication etc. Aria Telecom offers "PARTH MINI G" a unique solution that is suitable for Small & medium enterprise and housing society intercom system. PARTH MINI G is a mini-state of wireless intercom system suitable for housing societies, malls and commercial tower. You can use your mobile as an extension. The system is easy to install and has plug and play connectivity. 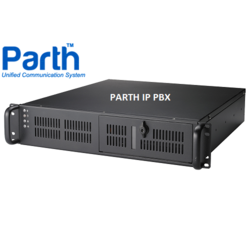 Parth BCS is wireless PBX system useful for housing societies and malls/commercials towers. Suitable for commercial complex, housing societies, SMEs etc. Application Housing society, malls, commercial tower etc. Aria Telecom takes pleasure to introduce unique wireless intercom solution for housing society, malls and commercial towers etc. It is mini state of IP PBX system. Aria Parth is an Unified Communication System which can be used as intercom system.Parth Office 1000 is an ideal choice for small to large office communication EPABX use. The system helps to establish communication on LAN network, you do not require cabling like PBX. Support ACD, CTI, IVR, Voicemail etc. Aria Parth is an unique and unified communication system for office communication epabx use.The system supports VoIP and TDM both networks. ISDN PRI can be connected with inbuilt card, analog trunk and gsm connectivity through gateway. Communication can be done on LAN network..
Parth Office 600 is Unique Unified Communication System which can be used as IVRS, IP PBX, Conference Bridge, Help Line System, OBD IVR, Telephone Recording System etc. It records the conversations which are done in parallel mode in Office, Corporate and in any organizations. Communication can be done on existing LAN network, no need to have separate cabling for traditional PBX.